Well, hello and good morning, King Garbage, No, YOU'RE the man. Warwick for morning show king!!! howdy doody Matt. Lovin' the sounds. Its lunchtime here in Amsterdam, so about to dig into sandwiched and tea! Yay! Matt Warwick go go go. A sandwich! In Amsterdam, no less! How awesome! Wat is de kleur van het tafellaken?! Good morning MW and my fellow detritus. Good morning, Matt! Thanks for the Thin Lizzy this morning. My phone always wants to autocorrect Thin Lizzy to Thin Liszt. Don't leave us dummies in suspense, Ajay! Tell us what kind of sandwich you're enjoying! "Alway's?" What's up with that? Good morning Brooklyn, Amsterdam, Thailand, and beyond! @CJ: someone appropriated part of your name. FRANZ LIZZY. There has to be a fledging pianist out there who can take that as a stage name and figure out how to do a Jailbreak/Years of Pilgrimage medley. @Matt WW - I thought that was spelled "Bayonne"??? @SC: Thanks, I will check that out. Cognitive resonance or coincidence? Good weed for good people. Good morning, Walt -- where are you from? It's always nice when good weed happens to good people. If I mash-up 2 listener names I get rebuketodaliSalvatore from Brooklyn. CJ, maybe just a thing for Carboxylic Acid. I think it's actually spelled "Beyonce." pls kp noiz dwn. tryn sleep. Good gawd. blew me mind. 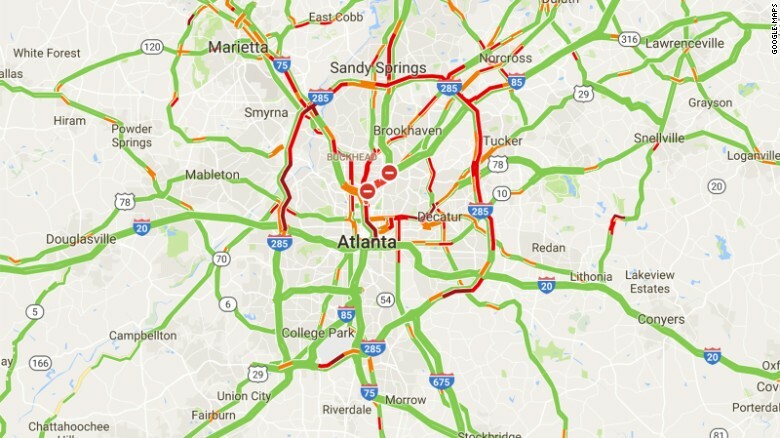 @Salvatore, I am in the greater Atlanta area, working from home today to see what the traffic will be like with I-85 being closed. That isn't really close to where I have to drive but I'm sure it's going to choke traffic all arount the I-285 perimeter. On top of that, the new baseball stadium will have its first (non-exhibition) game this week and I have to drive by that every day, so that will likely be an adventure. And by "adventure" I mean creeping along at 10 mph for two hours. Where is that confounded bridge? I read somewhere that Salvador Dali didn't like to bathe, Cooh John. Filthy Spaniard! Mash him up, I say! Sounds like a real nightmare, Walt -- I feel your pain. Good luck! I ain't seen the bridge, BEAVO. Matt playing Mott! Now I've seen everything! Well, I gotta get going, so I'll be seein' y'all! Seacrest out!! Best of luck, Walt. I live in the ATL as well, but I'm one of the fortunate ones that can take public transit into work. So excited we get Matt and his incredible music selection alllll week!!! Papa Garbage has been crowned Morning King?? It's going to be a killer week for mornings, thanks Matt! @Matt ww: very cool, thank you. rooting for you! Ah, this should be a good week...great way to start each day! Are you doing Garbage Time tomorrow morning in addition to the morning show? Good morning! So is it down to you and Jonsey now? I vote for BOTH of you, alternating weeks! Let me ride in the garbage truck! Got me a brand-new iPod Nano, let's hope the schmancy FM Radio function picks up 91.1! Woot! ACK! Where is the regular background music? Matt Matt Matt. There, I voted illegally twice. I love Glen Jones and X-Ray Burns, but Jonesy by himself falls a little flat. Matt on the other hand is a Tour de Force as a solo DJ! Jonesey does not have that warm inviting garbagy glow. If anyone cares, I did not get LCD sound system tickets!!! I'm liking the music today muchly. Good Morning Mr. Purple Artist! Did your jangly bass bed music go away?? bring back the regular background music, please!!! Great show as always. Doubleheader tomorrow! Good morning, Mister Garbage Dispenser. I've been hitting the snooze button about fifteen times already today, while trying to dream of lava lamps. I am waking up now. fantastic show this morning Matt. I would love an alternating mornings with Matt then Jonesy, You both are great to start the day with. @Kevlicki I'd vote for that! Looking through the garbage and the flowers of this morning....sorry, Mr. Matt, all flowers.